Nutritional oncology is an increasingly active interdisciplinary field where cancer is investigated as both a systemic and local disease originating with the changes in the genome and progressing through a multi-step process which may be influenced at many points in its natural history by nutritional factors that could impact the prevention of cancer, the quality of life of cancer patients, and the risk of cancer recurrence in the rapidly increasing population of cancer survivors. Since the first edition of this book was published in 1999, the idea that there is a single gene pathway or single drug will provide a cure for cancer has given way to the general view that dietary/environmental factors impact the progression of genetic and cellular changes in common forms of cancer. This broad concept can now be investigated within a basic and clinical research context for specific types of cancer. This book attempts to cover the current available knowledge in this new field of nutritional oncology written by invited experts. 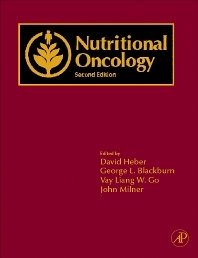 This book attempts to provide not only the theoretical and research basis for nutritional oncology, but will offer the medical oncologist and other members of multidisciplinary groups treating cancer patients practical information on nutrition assessment and nutritional regimens, including micronutrient and phytochemical supplementation. The editors hope that this volume will stimulate increased research, education and patient application of the principles of nutritional oncology. Researchers and graduate students in both nutrition and oncology investigating the intersection of these areas and the impact of nutrition both in prevention and therapeutics. Chapter 8: Are Whole Grains Protective Against a Variety of Cancers? Center for Human Nutrition, University of California, Los Angeles, Los Angeles, California, U.S.A.
Beth Israel Deaconess Medical Center, Harvard University, Boston, Massachusetts, U.S.A.
Department of Medicine, University of California Los Angeles, Los Angeles, California, U.S.A.
National Cancer Institute, Rockville, Maryland, U.S.A.